I've been having sleep trouble lately, so beds have been on the brain. Naturally, that led me to thinking about sleeping in Minecraft, and a few puzzling things about it. Since Steve could theoretically stay awake for his entire life (and, being ageless, this could be a very long time!) without going insane, it stands to reason that he does not actually require sleep to function, or survive. If he doesn't need sleep, and his body doesn't force him to sleep for any other reason, how does he sleep on his own? Is he actually asleep, or simply unaware of the passage of time? Is he aware, but we are not? Is he staring at the ceiling for 12 hours, wondering when the zombies will stop knocking at the door? Purely from a game mechanics perspective, the bed makes perfect sense: use it, and you bypass the (monster-infested) night, plus you get a nice new save point, should Steve kick the bucket. Whether or not Steve actually sleeps (or needs to) never comes up, but now that I've thought about it, the topic comes up every time I put him to bed in-game. 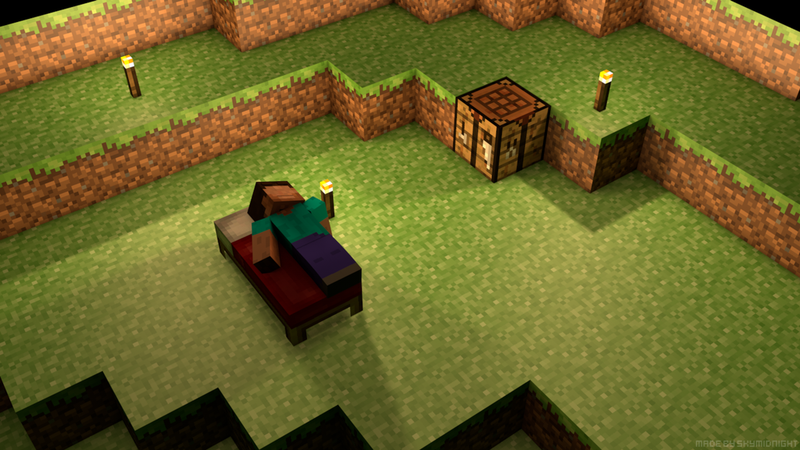 So, what do you think about sleeping in Minecraft? Does Steve need sleep, and has gone insane from weeks of players not letting him? Does he not need to, but does it anyway? Simply, sleeping is completely optional. He doesnt need it, and only does it when the mood strikes him. And maybe, a bed is the only thing he likes to sleep on. You can actually lay down and go to sleep in a dream. Doubt it? Then try it. Steve may be living the entire game within a dream realm, or artificial reality. Just as some scientists theorize that the reality we experience could actually be some form of virtual environment, the same could be true for MINECRAFT from Steve's perspective. You never need to sleep in a dream, because you are already sleeping. If a dream never ended you wouldn't be able to distinguish the dream from any other form of reality you could imagine. It's only from living in a world of wakefulness, that we can compare it to what we experience in dreams and decide that the world of sleeping doesn't really exist. You should get stoned more often. Well, he is constantly hunted by zombies, creepers, and all sorts of monsters. I'm sure survival instinct makes it so he doesn't sleep unless he finds a safe place to sleep. Back in Alpha, there was a chance that a monster would spawn next to your bed while you were asleep, and as a result, wake you up. I don't know why that doesn't apply anymore. Steve is an avatar. Your avatar, an empty shell. "He" doesn't need to sleep, because "his" body doesn't need it. If you don't move "him", at night zombies will kill him. When you put Steve to sleep the time just change, everything stays on it's place. Two things change. Rain stops and sun comes up. That's the rule, this is how you make it happen. So nope, he doesn't need to sleep, he doesn't dream, Steve is just an empty shell what acts on your will. What we're calling "Sleep" is actually Steve using the strange abilities of the bed to move the sun and moon and stars to make it day. Aren't Minecraft worlds all kind of dreams? I mean, for those who have seen the end poem, you surely understand what I'm talking about. Therefore, if Steve is in a dream, everything can be possible. He can be superhuman and doesn't need to sleep at all. Then how the heck did you comment this? Oh wait, sleeptyping. "Steve" doesn't need to sleep because, in reality, he's actually in a coma. All his adventures in Minecraft are a figment of his active subconcious in the coma. His name is not actually Steve, but due to his coma, he's unaware of his name. The little bit of sleep he gets during Minecraft are actually brief periods of him being awake in reality. "Passing the night" is merely his brain's way of coping with him slipping back into a coma. It merely resets the state of life that has become his cruel reality. This is why it rains more if he doesn't sleep, it's the visualization of his body trying to "sleep", which is really him trying to wake. That is why sleeping gets rid of the rain, he actually spent time awake. You can never really know how much time is really passing in reality, for all we see is Steve's dream realm. Those voices you hear after defeating the Enderdragon and jumping through the portal? His family managing to communicate with him through the nightmares. The life of "Steve" is cruel. I think what sleeping should temporarily raise your parameters (buff your char). Until the Somnia mod came along, what bothered me about sleep was that all the things that smelted or grew back after five minutes while awake, were still barely cooked or grown after sleeping the night. Fatigue is pesky when I'm in the middle of a major build, but the ores I stick in the furnace and the crops I planted before going to sleep are either ready or close to after I wake up. Maybe this mechanic should be considered for future game updates. if anyone has ever seen the show Steven universe, there are creatures called gems. These gems have superhuman strength, run faster then humans, can morph into anything they want, have better reflects/fighting skills, and sometimes sleep just for the heck of it even though their gems give them strength. So many Steve is a higher being like them that takes the form of a human? Look at ants, they don't sleep and they are fine. Leading me to believe he is not human. gems also can't die but retreat to their gems to regenerate. Gems also regen. Or he just sleeps whenever you log off. Maybe Steve's need to sleep can be measured by the amount of RAM your minecraft has.